✓ Continuous feed operation for quick results and less jamming. ✓ Motor spins at 1,725 rotations per minute. ✓ Steel shredding blade and grinding components made from galvanized and stainless steel. 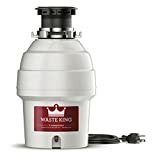 ✓ Option to connect the garbage disposal to a dishwasher drain. ✘ Several installation steps - may be difficult for some people to set-up. ✘ Does not have a power cord included. If you want this accessory, it needs to be purchased separately. Otherwise, the disposer requires electrical wiring into your home. This is a quality garbage disposal, made by a trusted brand name in home appliances. While this garbage disposal receives very positive reviews from users because of its excellent performance, it might not be for everyone. The installation process may be considered complex. Also, the warranty offered by Whirlpool is not as generous as some other garbage disposal manufacturers. Learn more about best garbage disposal brands. 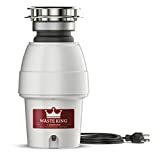 If you need to chop up a lot of food waste and get rid of it fast, the Whirlpool GC2000XE Continuous Feed Garbage Disposal may be the ideal device for you. This appliance packs a lot of punch and is made from durable materials. Jamming is reduced because of the disposer’s continuous feed functionality. If there are any issues during the food disposal process, the unit protects itself from potential mechanical failure. The garbage disposal’s overload protector can turn itself off if the unit starts to have problems. Check out differences between continuous feed and batch feed. The disposal isn’t “plug-and-play.” While it may be an easy install for the Do-It-Yourselfer, some homeowners may have trouble with the process. While the unit does come with an informative instructional manual, there are several pieces and steps during installation. Some customers may prefer the convenience of hiring a professional to install the GC2000XE for them. A sink flange made from stainless steel and a plastic stopper – for making sure waste doesn’t slip through. An “overload protector” that will keep the garbage disposer from overheating or malfunctioning in the case that it’s overworked. A multi-piece mounting kit for the custom installation of the garbage disposal into your sink. Discharge tube installation kit that provides an exit for the garbage disposal food waste into your home plumbing system. A motor that runs on ½ horsepower. Whirlpool’s 1 year limited manufacturer warranty. The ½ horsepower motor on the Whirlpool GC2000XE tears through food waste at over 1,700 RPM. It’s less likely that the unit will clog because it can effortlessly eradicate food waste and garbage. Efficiently grind through refuse and don’t worry about the system jamming up. 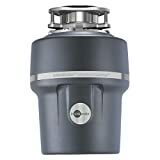 This garbage disposal is more powerful than other models Whirlpool has made, which makes it a popular and modern replacement for older designs. The oversized 26 oz chamber can process a lot of garbage. No need to empty it out during the middle of a job just to put in more waste. If the system does take in too much, it’s unlikely that it will break during the process. The disposal’s grinding wheel is made from galvanized steel. The shredder ring is built using stainless steel, so it won’t corrode or rust while chopping up food waste. The premium parts used to build this unit make for a painless garbage disposal experience. The overload protector prevents serious damage from happening. The disposer protects itself by automatically shutting down if it detects a potential issues. This means a longer life cycle for your unit. If the device does encounter any difficulty, the basic application of a wrench will clear up the jam in no time at all. Should you experience any problems after you purchase the unit, contact Whirlpool directly. Their one year limited warranty specifies coverage for replacement parts and major repair labor associated with qualifying defects in the disposal’s material or workmanship. 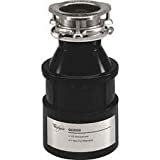 Buyers of the Whirlpool GC2000XE 1/2 HP Continuous Feed Garbage Disposal are generally pleased with the unit’s performance. Out of 154 verified purchase reviews, 70% of customers give the unit 5 stars. They speak positively for the garbage disposals efficiency in dealing with large amounts of food waste. Customers also report little vibration when the unit is running. Other consumers have commented on how the unit barely disturbs the design of their kitchen once it’s fully installed. As we talked about earlier, the biggest criticism is the installation process. Some users were able to install the disposal themselves after consulting instructional videos and the manufacturer’s manual. Others opted to have a professional install the unit for them. Results may vary depending on each person’s individual level of skilled labor.